The German government has set the goal of supplying at least 80 percent of its domestic energy demand with renewable energy by 2050 (Source: Monitoring Report by the Federal Ministry for Economic Affairs and Energy, “Die Energie der Zukunft in 2014”: Target for 2020 at least 35%, Target for 2050 at least 80%). A demonstration project in the City of Speyer and managed by Hitachi Chemical Co., Ltd. started on 31st of May 2016, with contribution of Slovenian subcontractors Robotina d.o.o. and 3 PORT d.o.o., should after two years demonstrate the proposed solution of self-consumption management. Demonstration project which integrates solar panels, central storage batteries, heat pumps and home energy management system hardware and software was set up for two residential buildings at an apartment complex in the city of Speyer in the German state of Rheinland-Pfalz and it will represent “Energy Self-Consumption Model”. Slovenian subcontractor company Robotina d.o.o. is participating in the project with HEMS – home energy management system equipment and programmable logic controllers (PLC). Company 3 PORT d.o.o. developed software using smart IoT platform SMIP tools for processing data from PLCs, data integration with weather forecast services, exchanging agregated data with systems for machine learning and forecasting of energy consumption. Prediction were hourly updated, received by SMIP software transformed in corrections of control procedures for PLC and automatically uploaded. The demonstration system predicts the PhotoVoltaic power generation based on data on the amount of solar radiation and predicts energy consumption (electricity and heat) based on the load patterns of each household. 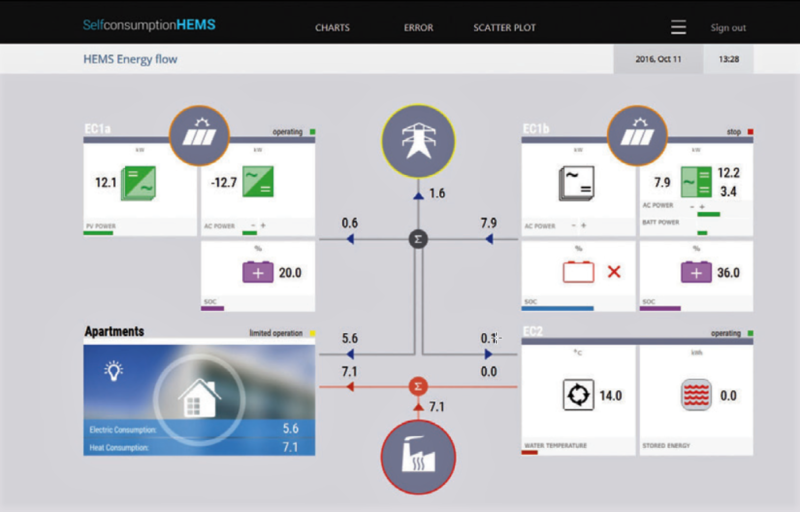 The HEMS control logic is designed to minimize both reverse power flow to the power system and energy costs for consumers based on a virtual power pricing model, thus optimizing storage battery and heat pump control. Additionally, the two apartment buildings are divided into “household unit” and “building unit” types in order to maximize the energy self-consumption rates for each kind of system. Over the course of approximately two years (until March 2018) of operating the demonstration system in a real-life environment, the project will assess the effectiveness, reliability, and economic efficiency of the new system. Smart community project went live May 31st 2016 in Speyer, Germany.